Neuman Celano library study: Educational technology worsens achievement gaps. 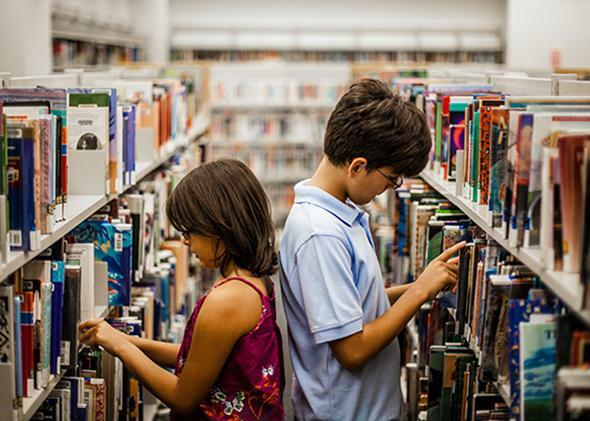 Affluent kids receive more guidance in libraries—new computers or not—than poor kids do. The local name for the Philadelphia neighborhood of Kensington is “the Badlands,” and with good reason. Pockmarked with empty lots and burned-out row houses, the area has an unemployment rate of 29 percent and a poverty rate of 90 percent. Just a few miles to the northwest, the genteel neighborhood of Chestnut Hill seems to belong to a different universe. Here, educated professionals shop the boutiques along Germantown Avenue and return home to gracious stone and brick houses, the average price of which hovers above $400,000. Within these very different communities, however, are two places remarkably similar in the resources they provide: the local public libraries. Each has been retooled with banks of new computers, the latest software and speedy Internet access. Susan B. Neuman, a professor of early childhood and literacy education at NYU, and Donna C. Celano, an assistant professor of communication at LaSalle University in Philadelphia, spent hundreds of hours in the Chestnut Hill and Badlands libraries, watching how patrons used the books and computers on offer. Neuman and Celano are not the only researchers to reach this surprising and distressing conclusion. While technology has often been hailed as the great equalizer of educational opportunity, a growing body of evidence indicates that in many cases, tech is actually having the opposite effect: It is increasing the gap between rich and poor, between whites and minorities, and between the school-ready and the less-prepared. This is not a story of the familiar “digital divide”—a lack of access to technology for poor and minority children. This has to do, rather, with a phenomenon Neuman and Celano observed again and again in the two libraries: Granted access to technology, affluent kids and poor kids use tech differently. They select different programs and features, engage in different types of mental activity, and come away with different kinds of knowledge and experience. The unleveling impact of technology also has to do with a phenomenon known as the “Matthew Effect”: the tendency for early advantages to multiply over time. Sociologist Robert Merton coined the term in 1968, making reference to a line in the gospel of Matthew (“for whosoever hath, to him shall be given, and he shall have more abundance: but whosoever hath not, from him shall be taken away even that he hath”). In a paper published in 1986, psychologist Keith Stanovich applied the Matthew Effect to reading. He showed that children who get off to a strong early start with reading acquire more vocabulary words and more background knowledge, which in turn makes reading easier and more enjoyable, leading them to read still more: a virtuous cycle of achievement. Children who struggle early on with reading fail to acquire vocabulary and knowledge, find reading even more difficult as a result, and consequently do it less: a dispiriting downward spiral. Now researchers are beginning to document a digital Matthew Effect, in which the already advantaged gain more from technology than do the less fortunate. As with books and reading, the most-knowledgeable, most-experienced, and most-supported students are those in the best position to use computers to leap further ahead. For example: In the Technology Immersion Pilot, a $20 million project carried out in Texas public schools beginning in 2003, laptops were randomly assigned to middle school students. The benefit of owning one of these computers, researchers later determined, was significantly greater for those students whose test scores were high to begin with. Why would improved access to the Internet harm the academic performance of poor students in particular? Vigdor and his colleagues speculate that “this may occur because student computer use is more effectively monitored and channeled toward productive ends in more affluent homes.” This is, in fact, exactly the dynamic Susan Neuman and Donna Celano saw playing out in the libraries they monitored. At the Chestnut Hill library, they found, young visitors to the computer area were almost always accompanied by a parent or grandparent. Adults positioned themselves close to the children and close to the screen, offering a stream of questions and suggestions. Kids were steered away from games and toward educational programs emphasizing letters, numbers, and shapes. When the children became confused or frustrated, the grown-ups guided them to a solution. The Badlands library boasted computers and software identical to Chestnut Hill’s, but here, children manipulated the computers on their own, while accompanying adults watched silently or remained in other areas of the library altogether. Lacking the “scaffolding” provided by the Chestnut Hill parents, the Badlands kids clicked around frenetically, rarely staying with one program for long. Older children figured out how to use the programs as games; younger children became discouraged and banged on the keyboard or wandered away. These different patterns of use had quantifiable effects on the children’s educational experiences, Neuman and Celano showed. Chestnut Hill preschoolers encountered twice as many written words on computer screens as did Badlands children; the more affluent toddlers received 17 times as much adult attention while using the library’s computers as did their less privileged counterparts. The researchers documented differences among older kids as well: Chestnut Hill “tweens,” or 10- to 13-year-olds, spent five times as long reading informational text on computers as did Badlands tweens, who tended to gravitate toward online games and entertainment. When Badlands tweens did seek out information on the Web, it was related to their homework only 9 percent of the time, while 39 percent of the Chestnut Hill tweens’ information searches were homework-related. Research is finding other differences in how economically disadvantaged children use technology. Some evidence suggests, for example, that schools in low-income neighborhoods are more apt to employ computers for drill and practice sessions than for creative or innovative projects. Poor children also bring less knowledge to their encounters with computers. Crucially, the comparatively rich background knowledge possessed by high-income students is not only about technology itself, but about everything in the wide world beyond one’s neighborhood. Not only are affluent kids more likely to know how to Google; they’re more likely to know what to Google for. It would take all this to begin to “level the playing field” for America’s students—far more than a bank of computers in a library, or even one laptop per child.